Add a personal touch to parties, events, meetings and celebrations with custom-printed place cards you can print at home. 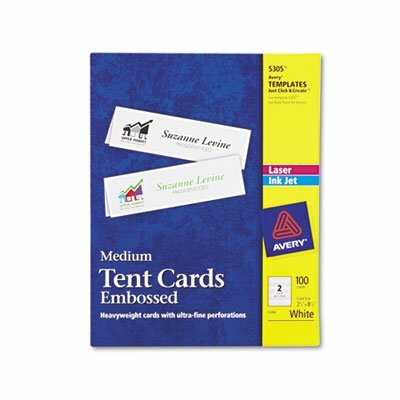 These bright white Tent Cards feature premium, heavyweight cardstock that stands up to frequent folding, making them perfect for use as place cards, on buffets or as product description cards at boutiques, trade shows or farmers markets. Ultra-fine perforations let you separate cards cleanly and easily and are pre-scored. Personalize and print with our free designs and templates at Avery Design & Print. Bright vibrant colors and sharp clear text can be printed on both sides for a polished, professional look that will add a special feel to any event. This product was made from wood sourced from a certified managed forest. Bright white card stock is ideal for name cards in meetings, presentations, seminars and classrooms.